With the Yandex.Disk program, you can create and edit screenshots, save them to Yandex.Disk, and even share them. To take a quick screenshot and share it right away, press ⌘ + ⇧ + 2 and then select the screen area you want to capture. The screenshot is automatically saved in the Screenshots folder on your Disk. The link to the screenshot is copied to the clipboard. The new screenshot opens automatically in the image editor. Select Screenshots in Yandex.Disk → Settings in the menu. Click the field to the right of the appropriate action. If you want to disable one of the combinations, click in the box to the right of the action. To disable all keyboard shortcuts for making screenshots, disable the Keyboard shortcuts option. Choose File → Settings from the menu. In the Format list, select JPEG. To take a screenshot and then format it in the editor, press Ctrl + ⇧ + 1, ⌘ + ⇧ + 4. 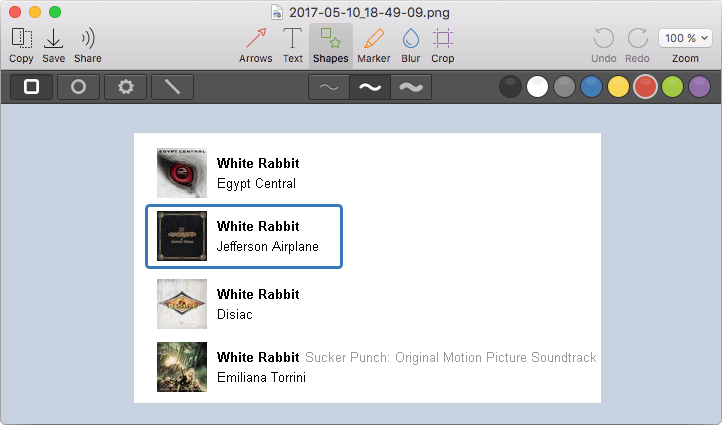 In the editor, you can crop the screenshot, insert arrows, simple geometric shapes or text. When the screenshot is ready, you can Save, print or share it. When you edit an image and click Save, the edited copy of the image is saved to Yandex.Disk. The original file will remain unchanged. Click Save to save the screenshot to Yandex.Disk. Click Copy: the screenshot will copy to your clipboard and automatically be saved to Yandex.Disk. Click Copy to copy the screenshot to your Yandex.Disk and copy the public link to the clipboard. Go to File → Print in the menu. If you encounter problems taking a screenshot, please submit the program log via the web app menu before informing our specialists. Click the Yandex.Disk icon in the notifications area, then choose Settings → Help → Report a bug.